My wife and I arrived at Dusty Rhodes Park at about 6pm, to a friendly dance party that had apparently been underway for at least a couple hours. Close to 200 revelers — most wearing joyfully psychedelic costumes — were mingling and dancing enthusiastically under the overcast skies. A DJ spun energetic house music along with an occasional light-hearted, humorous track, like a remix of Surfin’ Bird (“The bird is the word”) featuring Peter from Family Guy. 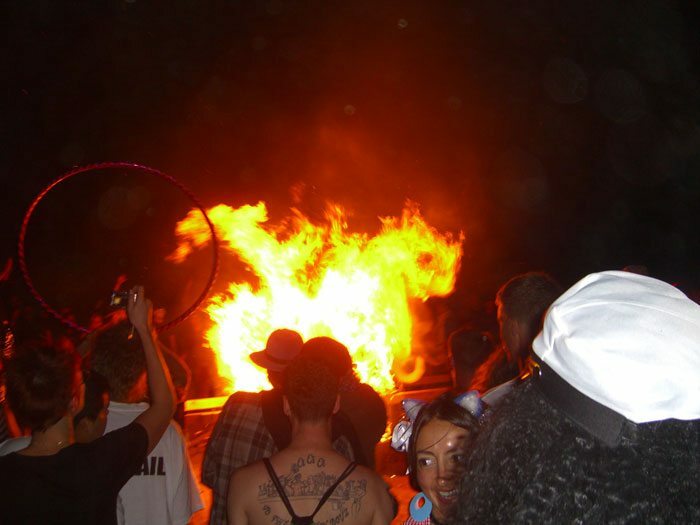 Ocean Beach’s Miscellaneous Heathens were at it again. 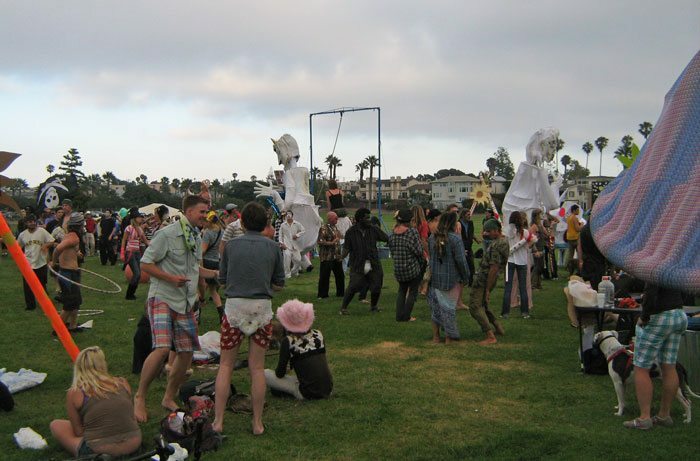 While the sun ended up a no-show and the temperature couldn’t have been much higher than 65F, not even the people wearing diapers seemed concerned with the weather. A sizable portion of the crowd was dancing at any given point during the evening, but it was still comfortable and easy to find a roomy plot of grass where the music sounded good and there was plenty of room to groove. Bright sculptures of mushrooms decorated the grounds and a half-dozen people wore costumes that stood at least 10 feet above the ground, lending the festivities a distinctly surreal air. Several attendees juggled, balanced on balls, or spun hoola hoops. A handful of small children were in attendance with their parents. A group of people that I recognized as frequent occupants of the park sat at benches at one end of the gathering, appearing to enjoy the music and the people-watching. Randolph and Derrick, two of the Heathens interviewed in May by The OB Rag, were not just participants in ,but coordinators of Saturday’s event. At about 7:30pm, Derrick got on the loudspeaker and began firing the crowd up for the parade, which he called “the best part of the party.” Randolph then took the mic to remind everyone to keep it cool during the procession. Last year, the Heathen’s walk met with a hostile response from police officers, who took issue with the group’s path down city streets and broke up the party on the beach, before the bonfire got going. As a result, organizers aimed to minimize the traffic impacts of this year’s procession. The procession got underway at about 8pm, and a few minutes later, the Heathens and their cohorts crossed Sunset Cliffs Boulevard at West Point Loma Avenue. The first half of the group crossed on a green light, but when the light changed to yellow, Derrick brought the second half of the group to a stop. “We’re working with the cops this year,” Derrick said to the crowd, waving his arms as a signal to stay on the sidewalk. Derrick was shirtless, on a pair of stilts, wearing a top hat with a pair of steam punk goggles wrapped around it — and the crowd happily obeyed his every word. When the light turned green again, Derrick raised his arms skyward, and the procession continued across Sunset Cliffs Boulevard and on down to Robb Field. Slowly but steadily, the Heathens crossed Robb, coming out on Bacon Street and taking a right on West Point Loma Avenue. After walking a few more blocks to the beach and then crossing a couple hundred yards of sand, the Heathens arrived at the grassy park just at the foot of Newport Avenue, just south of the lifeguard tower. Within a few minutes, several spectators had joined the marchers to smile and cheer under the moonlit night. 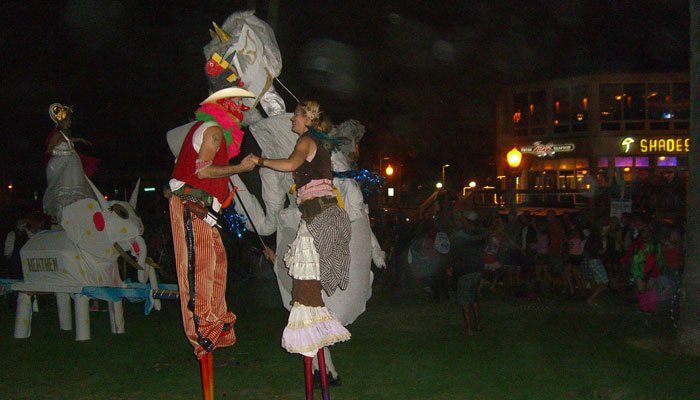 At that point, the folks on stilts said it was time for some Hokey-Pokey, and a vigorous round ensued. After the Hokey-Pokey, all that remained was the bonfire, which was ready and burning in a fire pit near Tower 2 when the procession arrived with the wooden, elephant-shaped throne that had carried the Queen. Within seconds, the elephant was blazing mightily and the Heathens were gleefully hooting and dancing in circles around the fire. Back during the Hokey-Pokey at the grassy park, I was keeping one eye on an older guy who seemed to have stumbled across the scene with his wife, perhaps while taking a stroll down Newport. After taking in his surroundings for a minute or two, he smiled and said, “This is tripping me out.” He looked happily confused, like he couldn’t quite figure out what the Heathens were up to, but could tell they were having fun. at last! the ob rag enters the era of video coverage. watch out tv news! The video coverage was great!! Cheers to OB’s largest hokey pokey. Hey!! Really Good Video! Looks like everyone had a good time & everyone went home happy. How did the beach look afterwards? Clean? How dare that many people have that much fun in 2010? Where was the private SECURITY? Where were the COPS AND COP CARS? Where were the official designated fenced in areas? Why didn’t these heathens have WRIST BANDS. This kind of wide open human unsupervised by the authorities stuff is just not good in an era of FAKE TERROR. don’t worry, dave, homeland security was probably there in an undercover role. look for the “fun out of OB” stickers to go sale at the Black next week. This 2010 lifestyle is real tough on us old farts. Learning wristband drinking. Reading the word SECURITY everywhere we look. I am sure Zee Fadderland Security BOZOS were there. After all it is possible there could have been a Muslim mastermind in that crowd. Wow! Obviously Comic Con had no monopoly on awesome costumes this past weekend. Thanks for the terrific coverage. Far out! great vid, Shane. What a peaceful eclectic crowd having random fun in OB. Long live the Heathens! Nothing in the world like having a ball. feel like a part of it all. First time to ever hear of this event ant probably will never miss it again** The vibe of the people and the feelings shared between all was to be the best ever!! Completely worth every minute and ready for next year!!!! This is what OB is about: a wonderful time had by OBceans, non-OBceans, homeless folks, kids of all ages, all captured by an excellent videographer. The Heathens rock! Somebody probably has already started the paperwork to BAN this. Way too much fun being had, sends up red flags like the freakin BAT signal to our draconian city council. Frank, is there a blurb being written about the Floatopia ban? I feel the need to comment. I’ve been out of town for a few days.